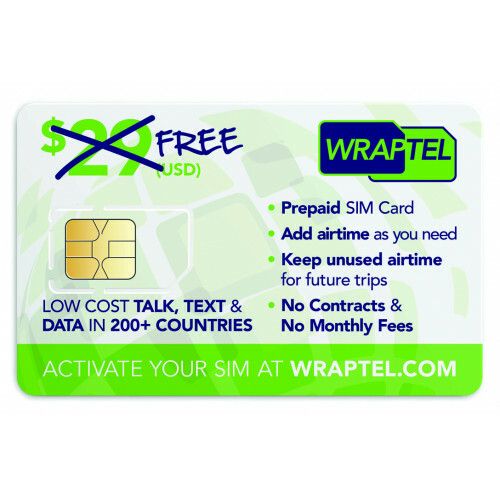 For a limited time, you can get an International SIM Card for FREE. Data is charged in 10kb increments. Why is this important? The SIM Card arrives as a triple cut out SIM; you decide to break it as a Standard SIM, Micro SIM or Nano SIM. Compatible with unlocked iPhones, Android Phones, Windows Mobile phones, as well as iPads and Android tables. Also works in traditional cell phones. Note: All devices must be unlocked. You can Checkout with most of the major credit cards; Mastercard, Visa, Amex, Discover, Visa Debit or PayPal. If you are paying by credit card please note that you will first be transferred to a Paypal Checkout Page. Select the ‘Pay By Credit Card’ button (at the bottom of the page) if you are paying by credit card. Please note that we use Paypal as our merchant processor and Wraptel Inc. will never hold or see your financial details. After check out, we will send you an email confirming your purchase and provide you with the information you'll need to get started and properly activate your new SIM Card.